Cal Poly Facilities Management and Development (FMD) has a number of capital projects currently under construction, or in planning and design. Each project strives to be sustainable in the areas of energy and water efficiency, use of renewable and recycled materials, recycling of construction waste, site erosion control, and use of native and drought tolerant plant species. Whether a project has a budget of $10,000 or $100,000,000, FMD staff strive to make sure that projects are designed and constructed with the environment in mind. Sustainability issues are considered during every phase of a construction project - programming, design, construction, startup, and commissioning. Throughout the life of a building, sustainability is used to guide operations and maintenance, including renovation and eventual replacement. 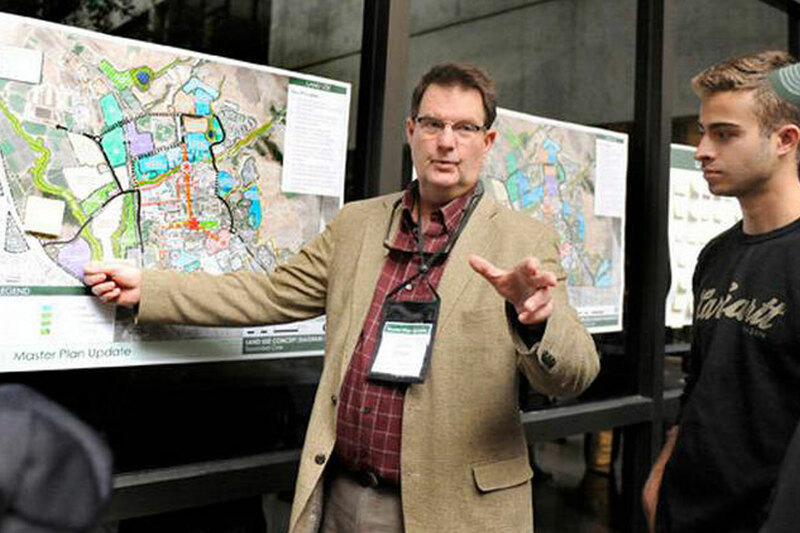 Cal Poly is in the process of updating the Campus Master Plan through 2035. Much of the plan is focused on developing additional student and workforce housing, which will reduce regional traffic congestion, improve air quality, and reduce carbon emissions from commuting. Research shows that housing all first and second year students should significantly increase student success, retention, and graduation rates. New academic and support facilities, and enhanced outdoor spaces will accommodate a future enrollment of 25,000. Sustainability is a guiding principle of the Master Plan. Smart growth measures include high density infill development, protection of important environmental resources such as prime agricultural land and open space, protective buffers around creeks, and continuing the transition to a pedestrian and bicycle friendly campus core. New facilities and campus infrastructure must be environmentally responsible, energy and water efficient, and showcase advancements in sustainable technologies. To support the enrollment growth and new facilities envisioned by the Master Plan, Cal Poly is undertaking a comprehensive Utility Master Planning process in 2018. Like a small city, Cal Poly manages utility infrastructure systems for electricity, natural gas, district heating and cooling, water, sewer, storm water, and telecommunications. These systems are being evaluated to ensure adequate capacity to support Master Plan development in a sustainable manner – considering issues like efficiency, carbon emissions, life cycle cost, and climate resilience. 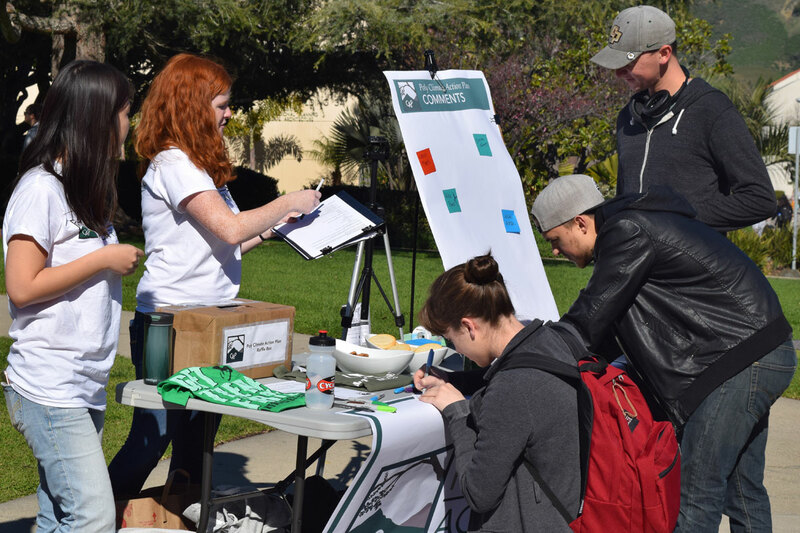 Cal Poly operates under Executive Order 987, the CSU Policy Statement on Energy Conservation, Sustainable Building Practices, and Physical Plant Management. This document sets minimum efficiency standards for new construction and renovations, and establishes operating practices intended to ensure CSU buildings are operated and maintained in the most energy-efficient and sustainable manner possible while still meeting the programmatic needs of the University. These policies and procedures are intended to provide guidance to Facility Managers and the campus community regarding acceptable building temperatures, Efficient Building Operations, procurement and use of Energy Star appliances, criteria for justification of air conditioning, and Design and Operation of Energy-Efficient Air Conditioning Systems. 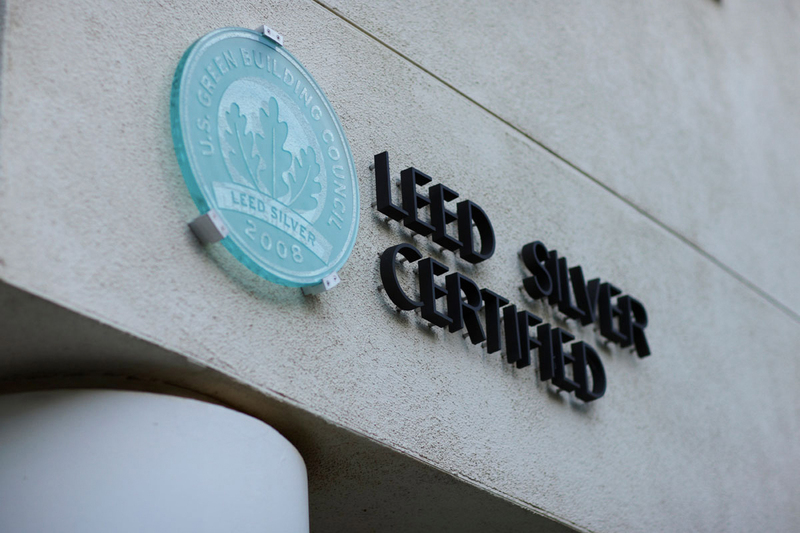 Cal Poly uses the United States Green Building Council's LEED (Leadership in Energy and Environmental Design) rating system to guide sustainable design of new buildings, renovations, and operations. As per CSU policy, all new facilities are designed to be equivalent to a minimum LEED Certified level, with the goal of each project achieving LEED Silver or higher. Since state general funds may not be used to pay for certification, the University attempts to find alternate sources of funding for LEED certification of each project. Cal Poly was awarded LEED Silver certification of the Faculty Offices East building in 2008 and LEED Gold certification of the Poly Canyon Village student housing project in 2009, resulting in over 25% of the campus square footage being LEED certified. Poly Canyon Village is the largest LEED certified project in the CSU. In addition, Cal Poly has a number of LEED Accredited Professionals within the staff of Facility Services and Facilities Planning. By state law, all new construction and renovation projects in California must comply with Title 24 Energy Efficiency Standards. Title 24 sets minimum efficiency standards for the building envelope (roofs, walls, doors, windows, and insulation systems) as well as building energy and water systems including HVAC (Heating, Ventilation, and Air Conditioning), lighting systems, and plumbing systems. The latest edition of Title 24, issued in 2005, sets the highest energy efficiency standards in the nation. 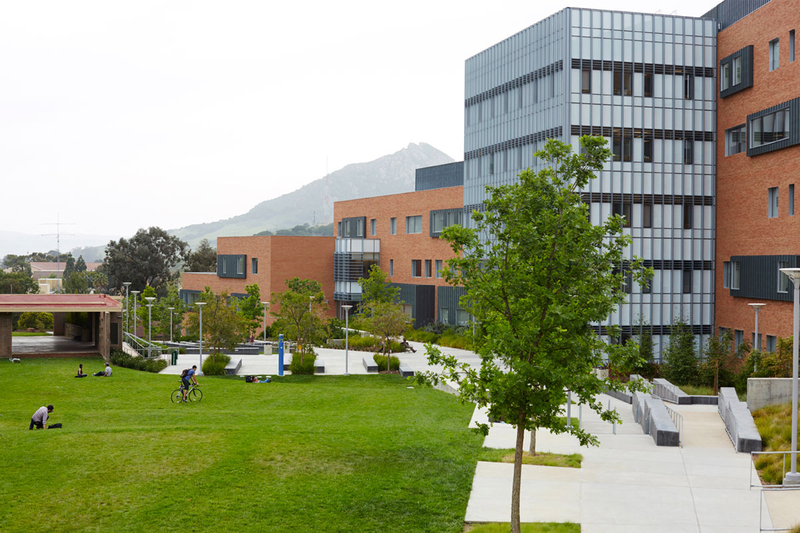 Cal Poly, as per CSU Executive Order 987, must design new buildings to exceed Title 24 by a minimum of 15%. Renovations must exceed Title 24 by a minimum of 10%. The American Society of Heating, Refrigeration, and Air Conditioning Engineers publishes a number of technical standards that guide the design, manufacture, and construction of HVAC&R equipment and systems. ASHRAE 90.1 is the Energy Standard for buildings in the United States, and has been a key driver of energy efficiency improvements in the building industry. The US Department of Energy requires every state in the US to adopt an energy code that meets or exceeds ASHRAE 90.1. Laboratory buildings are notorious energy and water hogs. Many energy systems in lab buildings run 24 hours per day, and heating and cooling systems usually use 100% fresh outside air for safety, meaning that all conditioned air supplied to occupied spaces is exhausted rather than reused. A single fume hood can use as much energy as an average US home. Since lab buildings are exempt from Title 24 Energy Code for safety reasons, a new voluntary benchmarking system, Labs21, has been developed by the EPA and Lawrence Berkeley Labs to establish best practices in lab design and promote the development and adoption of advanced strategies for energy and water efficiency. The Labs21 program was an essential in guiding the design of the new Center for Science building. Cal Poly has developed an approach to the design of new buildings to ensure that sustainability is a top priority. This process starts during programming and carries all the way through startup and commissioning. To review the full process download this linked document. Cal Poly has established itself as a leader in sustainable building design and construction, both for new buildings and major renovations. Major Capital Projects (over $600K in value) are primarily managed by Facilities Planning and Capital Projects. Minor Capital Projects (under $600K in value) such as remodels, small renovations, maintenance and repair of buildings, grounds, and utilities are managed by Facility Management and Development. Originally constructed in 1972, Vista Grande Restaurant is being demolished over summer 2016 to make way for a new facility to feed the growing student population in the residence halls, and is scheduled for completion by Fall 2019. The three story facility will include six micro-restaurants for both students and staff, indoor and outdoor seating and lounge area, and will focus on nutrition and sustainably sourced food including Cal Poly student-made products. The project is targeting LEED Gold certification, and will incorporate best practices in energy efficiency and food production. Housing costs in San Luis Obispo can be a challenge to recruitment and retention of faculty and staff, and commuting accounts for over 50% of Cal Poly's total GHG emissions. 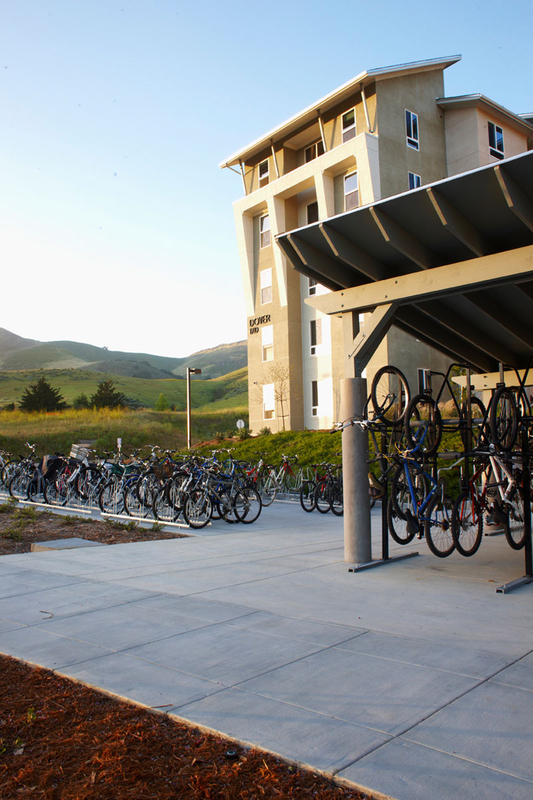 Analysis performed as part of Cal Poly's first Climate Action Plan showed that providing additional workforce housing on campus, designed to a LEED Gold standard, would result in a 20% reduction in total per capita GHG emissions. Incorporation of rooftop solar PV would result in even greater reductions. Solicitation for the first such workforce housing project at the corner of Slack Street and Grand Avenue, to be delivered by Public Private Partnership, began in May 2016 with a directive from President Armstrong to achieve LEED Gold Certification. In Fall of 2018, the Yakitutu Student Housing Complex was completed to support Cal Poly's ongoing transition to a 24/7 residential campus. Sited on 12 acres of former surface parking lots on Grand Avenue, the 1,475 bed freshman residence hall is comprised of seven buildings and a 473 space parking structure. Reduction in cars being brought by freshmen and alternative transportation programs will make up for the reduction in parking spaces. Cal Poly is now able to house nearly the entire freshman and sophomore classes on campus, which studies have shown significantly improve student success and graduation rates. The project is contracted to achieve LEED Gold certification, and includes plans for 1 MW of rooftop and covered parking solar PV, to be delivered via power purchase agreement. The Warren J. Baker Center for Science and Mathematics (Baker Science) was completed in summer 2013 and opened for classes in Fall 2014. The $119 million, 189,000 square foot building replaced the north wings of the aging Science Building 52 with six levels of state-of-the-art laboratories, classrooms, faculty offices, and student spaces, in the heart of campus. Baker Science incorporates advances in sustainable design, construction methods, and building monitoring systems to provide a physical example of Cal Poly's environmental stewardship. Just as science and mathematics are central to the polytechnic curriculum, pedestrian pathways from the residence halls, public transportation, the University Union, campus dining facilities, and the bookstore, all lead to Baker Science. The expanded Recreation Center opened in January 2012 and is a destination for the Cal Poly community to relax, recreate and socialize. The space was created through the shared vision, hard work and financial commitment of Cal Poly students. The building design includes an Indirect/Direct Evaporative Cooling (IDEC) system that provides virtually all of the cooling needs of the building. The building also includes a living roof, low-energy, high-efficiency HVAC and lighting systems, as well as shaded glazing that floods the interior with natural light. The Recreation Center achieved Leadership in Energy and Environmental Design (LEED) Gold Certification. The complex exceeds California Title 24 Energy Efficiency Standards - student apartments are not air conditioned and utilize natural ventilation via operable windows; air conditioning systems for administrative offices and retail spaces are high efficiency. Apartments are heated by radiant hot water panels integrated into the ceiling - these have no moving parts, no heat losses, and use just 10% of the energy used by blowers that supply heated air. All heating, cooling, and hot water systems are controlled by a sophisticated digital energy management system. The building uses 30% less water than allowed by the 1992 Energy Policy Act by using low flow plumbing fixtures, native and drought tolerant species in landscaping, and computerized irrigation controls. Heating of the complex is delivered by two central plants utilizing high efficiency boilers and cogeneration. Housing of 2,700 students on campus significantly reduces transportation impacts from commuting including traffic, air pollution, and emission of greenhouse gas. Poly Canyon Village received LEED Gold certification in 2009, making it the largest LEED certified project in the CSU. Founded in 1901, Cal Poly has a rich architectural history. The current campus still has a number of historic buildings with the oldest dating back to 1908. The history of sustainability on campus is visible in the evolution of campus building design and construction over the different eras of the last century. Many early buildings reflect the Spanish architecture of the central coast, with plaster finishes and terra cotta tile roofs. A construction boom followed World War II as returning veterans used the GI bill to complete their education. Buildings of this time were utilitarian, simple and cheap. Campus doubled in size during the massive construction boom of the 1960s, which ushered in the era of monolithic concrete structures. These proved to be very sustainable due to their durability and passive building features such as natural ventilation and large thermal mass. Even though energy and water were considered relatively cheap and limitless commodities prior to the energy crisis of the 1970s, the campus administration made a conscious decision not to air condition the vast majority of buildings, taking advantage of the mild central coast climate. The technology boom of the 1980s brought higher education into the digital age, and the proliferation and density of computers created a need to air condition both new and existing buildings. The massive escalation of construction and material costs of the late 1990s and early 2000s essentially ended the era of concrete buildings due to high costs. Designs evolved to the use of steel frame construction with more complex wall, roof, and window systems to make building systems energy-efficient. Over the years, the perpetually developing campus has been extensively documented through Historical GSF, including everything from significant changes in HVAC, lighting, and plumbing systems, with the largest changes beginning in the 1980s with the advent of computerized building automation control systems.